When installing a capacitor, it is necessary to verify that when it is switched off it can discharge so that the presence of a voltage at its terminals will not be dangerous for people and things. In compliance with the Std. IEC 60252-2 for the power factor correction of motors discharge devices are not often required since the motor windings functioning as discharge resistances. When a discharge device is provided, it shall reduce the voltage at the capacitor terminals from the peak value of the rated voltage to a value of 50 V or less in the time of 1 min from the moment the capacitor is switched off. A discharge device may sometimes be specified, not for safety reasons, but to prevent electrical overstress on the capacitor: this may occur when a disconnected capacitor still charged is reconnected across another capacitor of different polarity. The Std. 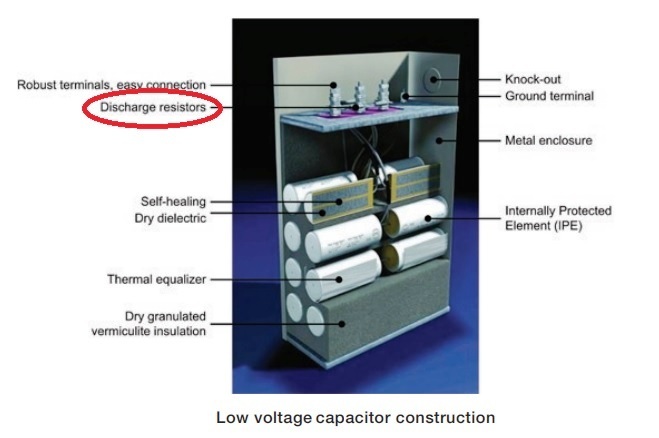 IEC 60364-5-55, clause 559.8) prescribes the use of discharge resistors for compensation capacitors having a total capacitance exceeding 0.5 μF (75/25 KVAR with star/delta connection at 400 V). Resistors have the purpose of nullifying, within a short time, the residual charge on the plates of the capacitor once it has been disconnected from the network. It is a good rule to provide discharge resistances for all the capacitors with power exceeding 0.5 KVAR, for whatever supply voltage. In compliance with the Std. IEC 60831-1 clause 22 ‘Each capacitor unit and/or bank shall be provided with a means for discharging each unit in 3 min to 75 V or less, from an initial peak voltage of √2 times rated voltage Un.’ Attention is drawn to the fact that in some countries smaller discharge times and voltages are required. C is the capacitance of the capacitor bank in Farads [F]. To comply with the prescriptions of the Std. IEC 60831-1, t = 180 s and Ur = 75 V shall be put in the above formula. PF controllers are microprocessor based controllers, which takes real time inputs from the network like the current input signal from the load current transformer and the Voltage tapped from the Bus, then calculate the KVAR required and produce switching commands to control the contactor ON/OFF of the capacitor steps. Intelligent control by PFC controllers ensures an even utilization of capacitor steps, minimized number of switching operations and optimized life cycle. The controller placed inside the panel shall have the reliability to withstand the operating temperature of at least 50 °C or more. C/k value is used in the setting of old generation Power Factor Controllers, however it is found rarely to be used in panels now. C/k value is a threshold value for switching On/Off the capacitor steps by the controller. C/k is the value obtained by dividing first step capacitor power “Q” to the current transformer ratio”K”. This setting shall be automatic or can be set manually. Automatic C/k- value setting, Connection of different capacitor steps. Automatic detection and usage of optimum capacitor steps. Current measuring 10mA-5A, suitable for connecting CT x/1A and x/5A. Various metering parameters like V, I, THD-V, Hz, KVAR, temp, PF etc. The first two steps have the same power as step no. 1, but from step no. 3 onwards power is double. The first two steps have the same power as step no. 1, the 3rd step has twice the power and from step no. 4 onwards power is triple. From the 2nd step onwards power is twice that of step no. 1. The power of the 2nd step is twice that of step no. 1, and from step no. 3 onwards power is triple. The power of the 2nd step is twice that of step no. 1, the 3rd step triples in power, and from step no. 4 onwards power is quadruple. The power of the 2nd step is twice that of step no. 1, and from the 3rd step onwards power is quadruple. Suitable for all step types. (The controller always begins by energizing or tripping the 1st step, then the 2nd step). Caution: this program only operates in optimum mode if the number of capacitor bank steps has been properly set. 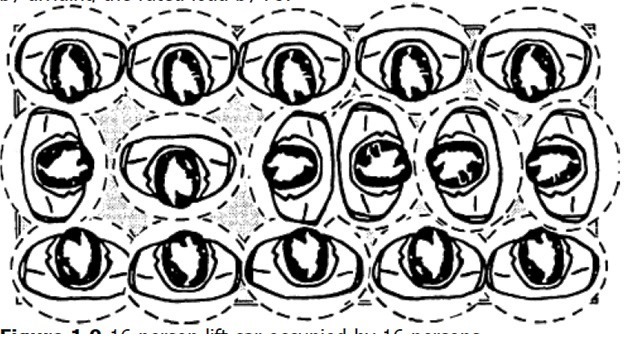 Steps: 1.2.2.2.2.2., circular sequence as from the 2nd step, the 1st step is used as an adjustment step. The last step energized is tripped 1st. They represent the Physical/real capacitor units seen by you inside the PFCC panel where their KVAR sum is equal to the total KVAR required for power factor correction and each physical step is tripped individually by a contactor. they represent the KVAR power seen by the electrical installation according to the connected physical steps KVAR at each time, so their total KVAR is varying according to the load variations of the installation and their quantity =total KVAR required/smallest physical step KVAR. This is equal to the number of electrical step, multiplied by the power of step no. 1 which is always the smallest step. Using 10 capacitors with 10 KVAR each to get the 100KVAR = 10 x 10 KVAR, in this case we say that the number of physical steps = the number of electrical steps. The step combination in this case will be 1.1.1.1.1.1.1.1.1.1 and this case called the physical steps method. 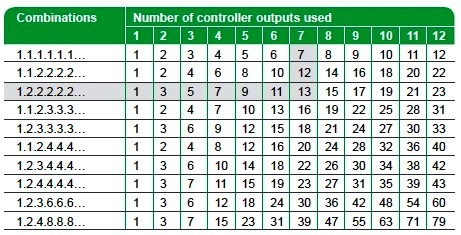 Using the below table-1, you can find the number of electrical step. Find the used step combination, calculate the number of electrical steps and calculate the possible power for each electrical step? 13 possible electrical steps, with only 7 physical steps which is the Optimized Solution. 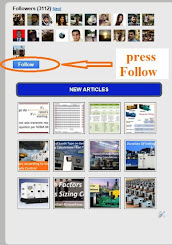 Consider an APFC System of 250 kvar, calculate the number of electrical steps and calculate the possible power for each electrical step and Find the used step combination using the physical steps method and the electrical steps method? 4 nos. electrical steps will be used with the following ratings 25, 50, 75, 100 KVAR. High Labor, high cost: non-optimized solution when using the physical step method. Optimized Solution when using the electrical step method. When designing a capacitor bank, it is important to break down the total power Qt (KVAR) into several steps so as to ensure the best compromise between the number of steps and suitable regulation.so, first select the required number of electrical steps then Calculate the smallest physical capacitor unit = total KVAR required/ required number of electrical steps. The sum of the physical step power ratings must corresponds to the total reactive power. The maximum switching power of the contactors ≤ 60 kVAr at 400-440 V in order to switch the three-phase capacitors. Don’t exceed the maximum number of relay outputs the controllers can switch. For capacitor banks with few electrical steps, we recommend increasing the step switching times. It is possible to create physical steps > 60 kVAr via simultaneous control of 2 contactors, divided between 2 different capacitors, by the same controller relay output, to which it is essential to add a time delay of 1 second minimum. For Example: To create high-power capacitor banks > 1000 kVAr, a few 100 kVAr physical steps can be created by switching a 50 kVAr contactor-capacitor pairing twice at the same time. For the highest power ratings requiring steps > 18 steps. It is possible to use the same principle of physical steps > 60 kVAr by simultaneously controlling 2 contactors divided between 2 different capacitors using the same controller relay output, to which it is essential to add a long enough time delay (a minimum of several seconds). In the next article, we will explain how to choose Cables for Power Factor Correction Capacitors. Please, keep following.